Please use the comments section below to post your prayer intentions. Keep in mind that this will be publicly visible, so only share details that you are comfortable with others seeing. Father could you have everyone pray for my son who is getting very serious with a Mormon girl. I just know the pitfalls marrying outside your faith..but being Mormon is another thing entirely! I worry about their children…my future grandchildren. My heart is aching because I am sick about this. He says I don’t have to worry because he won’t convert to Mormonism, he thinks it is a cult! I didn’t want to put this on Facebook with my name because I don’t want my name on the post! Please pray for him and this girl to make good decisions regarding their future together. Please pray for my son Noel and for his blessed healthy childhood and for his hapiness and all of his needs and for my family and me and our protection from evil and for all needs and faitfulness to God and to each other and that we are the best mum and dad ever . From September 11, 2018 I fell at work and I have been going in and out of the doctors. 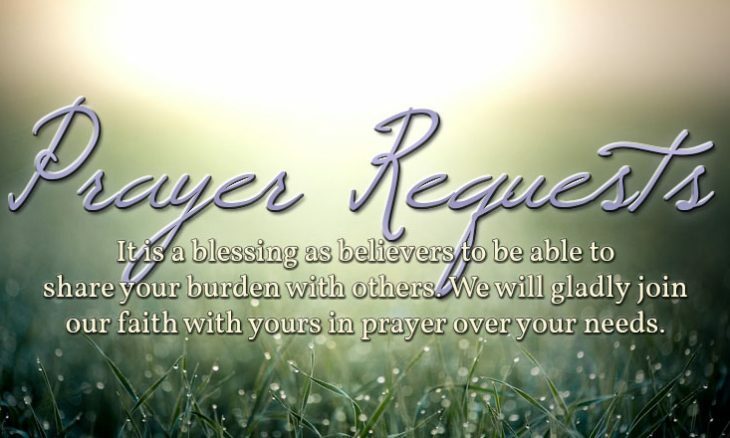 Please pray for Physical health for me for my back shoulder arm and wrist to be healed to the Greater glory of God. This past year from June till now my family and I have be struggling with life. Things have always be difficult but since June, we’ve moved twice, battled our former landlord in court, been flooded, a used by my mother in law, surgeries, my kid have yet to really adjust. My autistic son has struggled the most. It effected so hard that he went from happy go lucky to aggressive with no sign of getting. My wife and have on going health issues. More we try the worse it gets. Trying to get out, but a house. I’m become so afraid that one more misstep or bad turn and we’re done. I know we all struggle but I need relief, hope. Thing to go in the right direction. This is my 9th month of pregnancy and my due date is given from 21st to 23rd Feb. My mind has been under a lot of spiritual attack with all thoughts of negative past experiences, worry, fear, anxiety, thinking unwanted thoughts and doing unwanted things. My prayer life also is gone totally down where I feel lazy to pray or my mind gets preoccupied with other things and my mind wanders. Please pray for my safe and Normal delivery and healthy baby. Please pray that I may be able to take care of my baby as I don’t know how to handle as a first time mother. I still worry about my parents. I only pray that God may touch their heart and mind to repent and change their lives and attitudes. I pray that they may come closer to God and experience his love joy peace healing and mercy. My mom Alice is full of criticism, negative attitudes, and judging others and always disturbed and unhappy. My dad Darlan drinks a lot and has anger hatred and revenge with a lot of people. He talks bad about others whom his does not like and destroys their name with false stories. People also instigate him with all bad corrupt things of others etc and he believes it all to be true. My father is not able to forgive anybody. My father is a stroke patient and is spoiling his life drinking. Mom also is unhappy and there is no joy at home. Mostly they fight. They need inner healing and deliverance prayers. My husband also is angry and hurt with my parents behaviour of how they treat me for marrying him. They believed all false stories that he is a cheat and liar. We have been married for 2 years. My husband does not want me to talk to my mother too much because of her negativity and the things of the past what she has said to spoil his name. My husband also does not want me to call my mother to hospital for delivery because when I told her that I was pregnant that first reaction she gave was out of frustration because of my father saying that my father will get a stroke if he hears the news. She apologised for it and supports me now but my husband says she cursed the child and he is upset. My husband says he will cause a scene at the hospital and put my mother to shame in the hospital. I have told my mom about this but not told my husband that I have shared with mom.There are a lot of things they have done which my husband cannot accept and forgive. All these thoughts worry and upset me. Please pray for my husband Jowett to be forgiving and understanding towards my family. We have a lot of fights because of my parents. I pray for peace and unity among all of us. Im trying to make peace. We are also going through financial difficulties. My parents need inner healing and deliverance prayers. They always sit and blame others for their problems. They hardly compromise and never have solutions to problems. I’ve experienced this home situations before marriage. My father is a stubborn man who walks out and drinks in anger when a fight at home. Please pray. God bless you. Please pray for Madam Teo Bee Go daughter in law Madam Lucy who have severe breast cancer. Her breast cancer viruses have spread to her brain. Now Madam Lucy have breast and brain cancer. She is unwell because of the chemotherapy treatment. Pray for her healing that Madam Lucy will be healed and getting better. Thank you very much for your prayers. God bless you always. Dear ones, pray for me: I am damaging my soul, I am a living corpse. I can not free myself from my perversions, I live in depression and lukewarmness. How I would like to find a holy job suitable for me, as soon as possible because I have already wasted 2 years without doing anything, and my mother does not have a pension and my half disabled father keeps us all three. I feel guilty, no one wants me to work and I can not find it because of my fears that I carry around since I was a child and they stop me. I do not have a friend to talk to, I’m an only child, do not like me and I can not love anyone even my neighbors. I’m disappointing everyone. How I would like to find friends who treat me like their brother. How I would like to find a holy traditional Catholic priest who converts me and guides me on the right path (the parish priests of my country are all spiritually extinguished) Help me, I’m losing hope, I have so many suicidal thoughts. Please pray for me and my soul. Alessandro from Ruffano (Italy). Carissimi pregate per me: mi sto dannando l’anima, sono un cadavere vivente. Non riesco a liberarmi dalle mie perversioni, vivo nella depressione e tiepidezza. Quanto vorrei trovare un santo lavoro adatto a me, il più presto possibile perché ho già sprecato 2 anni senza fare niente, e mia madre non ha la pensione e mio padre metà disabile ci mantiene a tutti tre. Mi sento in colpa , nessuno mi vuole per lavorare e io non riesco a trovarlo a cause delle mie paure che mi porto dietro sin da piccolo e mi bloccano. Non ho un amico con cui parlare, sono figlio unico, non piaccio e non riesco ad amare nessuno neanche i miei vicini di casa. Sto deludendo tutti. Quanto vorrei trovare degli amici che mi trattino come loro fratello. Quanto vorrei trovare un santo sacerdote cattolico tradizionalista che mi converta e mi guidi sulla giusta strada( i parroci del mio paese sono tutti spenti spiritualmente)Aiutatemi voi, sto perdendo la speranza, ho tanti pensieri suicidi. Vi prego pregate per me e la mia anima. Alessandro da Ruffano (Italia). I ask prayers for my health especially for an incurable ear disease that is causing my deafness and could become bilateral. My son does not call me neither does he answer my call. This April he turns 30 but is jobless. with a good job at least in a hospital at the laundry department or security side. Pray for him to come back home. I’m his mother. Ask him to call me. Please pray for Eric M. Please pray for the salvation of his soul. Pray God to heal his soul and reveal his love in Eric’s heart. Pray God to help Eric to know Jesus Christ as his Savior and his Lord. Pray for the joy of salvation to fill his soul. May The Immaculate Heart of Mary, be a constant presence in Eric’s life. May All the Holy Angels and Saints pray for Eric M!!! I ask prayers for my son to receive the grace needed to keep his resolve to stop drinking. Also for the grace to battle other addictions in his life. Prayers for Amanda that she may be blessed with a second child. I ask for prayers for my husbands conversion. along with other members in our family who have left the faith and those who are non believers. Healing for my marriage and for me to live out my vocation as a Catholic spouse, with kindness and forgiveness. Prayers for my other son to find direction for his life, in line with God’s will. Also for grace to battle his addictions. Prayers for my daughter to be able to see things clearly and have good judgement along with my son in law. God bless my Grand daughters with health and joy as they grow up in the faith. Prayers of thanksgiving for all we have been blessed with. Prayers for all my family in their need. Amen. Thank you and God bless. I ask prayers for my children, two of them got engaged and have decided to get married this year. I ask our Blessed Mother to give them the grace to open their hearts so She can place Her Son in their hearts and those of their fiancées, for all of them to live in the Lord, for all of them to learn to put God first in their lives. I ask prayers for their conversion. Thank you.